Anthias are members of the Serranidae family, which encompasses over 65 genera and 450 species. Anthias are a commonly kept aquarium species due to their bright colors and brilliant patterns, shoaling habits and their willingness to spend the day actively swimming in the water column. The Bartletts Anthias (Pseudanthias bartlettorum) is one of the most commonly sold anthias species sold in the marine aquarium industry. Some other anthias commonly available for sale are, the Disbar Anthias (Pseudanthias dispar), Squarespot Anthias (Pseudanthias pleurotaenia), Lyretail Anthias (Pseudanthias squamipinnis) and Sunburst Anthias (Serranocirrhitus latus). Anthias can be found in the tropical and subtropical oceans worldwide. They are typically small fishes with an average of 4” (10 cm), although some larger species can reach in excess of 12” (30 cm). Anthias are typically found shoaling by the hundreds, or even thousands and feeding in the open water on zooplankton such as copepods and mysis. Anthias are protogynous hermaphrodites, with females outnumbering males. Anthias are pelagic spawners, releasing their gametes into the water column. Anthias can make great aquarium inhabitants, provided their husbandry needs such as diet, water quality and tank space are met. The most important aspect of keeping anthias in captivity long term, is providing them with high quality nutrition and multiple feedings per day. Most anthias prefer a temperature range of 72F (22C) to 80F (26C). 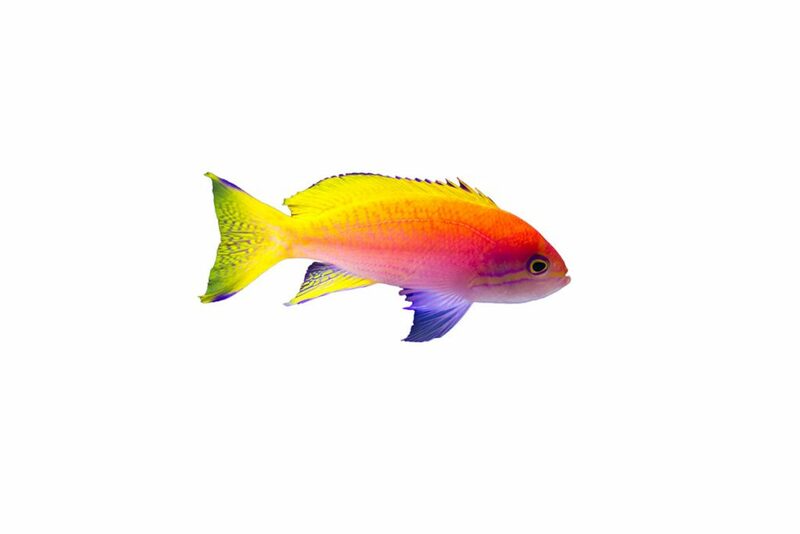 Anthias are generally considered reef safe as they will not harm corals or invertebrates. It is important to consider carefully what species of anthias may be best for your aquarium. While smaller species such as the Lyretail Anthias (Pseudanthias squampinnis) are suited to tanks as small as 40 gallons, larger species such as the Blotched Anthias (Odontanthias borbonius) may be better suited to a larger tank.